Your hot tub cover is an important part of your hot tub system, especially in Canada with our harsh weather climates. A durable and sturdy hot tub cover insulates your hot tub properly so that heat does not escape or let cold air in. A good hot tub cover will help you to conserve heat, save on electricity costs and keep debris out of your hot tub. If your cover is torn, broken or water logged, you should consider replacing it to continue to maximize the efficiency of your hot tub. At our Leaside store in Toronto, we can help you with the purchase of a new hot tub cover. 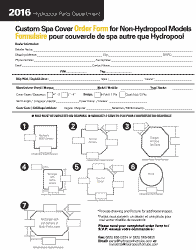 Custom fit for your hot tub size and shape – measure your hot tub and include your manufacturer make, model and year. BonaVista can replace your hot tub cover with any size, shape, model and color that you require. Please note that the manufacturer, model and year of your hot tub are important pieces of information to ensure the hot tub cover fits correctly. It is also good practice to measure the dimensions of your hot tub to ensure these pieces of information match up. When your hot tub cover is in good condition, it should be easy to remove. You know it is time for a new hot tub cover when the foam of your old cover becomes very heavy and difficult to lift. The heaviness comes from the small airspaces in the cover’s foam that eventually fill with moisture due to rising steam.